An effective business statistics course helps students understand how to think statistically and provides a statistical tool kit that they can use for ultimately solving the applications, and making the business decisions, that they will subsequently encounter in their careers. In order to provide a focus on business applications, many books “cut corners” on mathematical rigor and correctness. Complete Business Statistics does not make this trade- off; instead, it provides a strong focus on applications while always maintaining a rigorous, mathematically correct presentation and explanation. Clarity is found in the quality of the explanation rather than the quantity of words used. Thus in Complete Business Statistics, the goal has always been to be both as clear and as concise as possible. Practicing with a large number of interesting and engaging problems is at the heart of any quantitatively oriented textbook that emphasizes student understanding and retention as much as it emphasizes the accurate exposition of its subject. For that reason, having an extraordinary range of practical, challenging problems related to all functional areas and types of businesses— problems using real companies both US-based and international— has always been a hallmark of Complete Business Statistics. 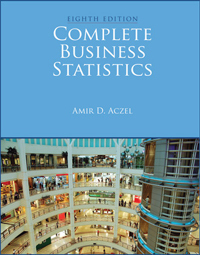 Two Types of Practice Problems: As with previous editions, a diverse set of computational problems is offered with this new edition of Complete Business Statistics. However, with this Eighth Edition we have also added a wide array of new, interpretive problems, using summary data, further encouraging students not only to do statistics but also to think statistically. They are designed to teach students when and how statistics can be applied in the business environment and how to interpret and act upon the statistical results, whether calculated by them or (very often) by someone else. This expansion of their understanding and skills is central to utilizing the contents of this course in the jobs students will have after graduating. Expanded Coverage of Covariance: With the Eighth Edition we have expanded the coverage of covariance, given that this concept is of particular interest and relevance to finance students. Real World Cases: These interesting and realistic end- of- chapter cases provide a more complex alternative to the traditional end- of- chapter problems. Optional Excel Templates: Included with the book are a collection of Excel templates, which allow for easy computation so that students can concentrate on the concepts behind the numbers, rather than the formulas. Non-platform specific, the templates can be used regardless of the operating system of the computer. Designed for those classes in which an instructor does not want to focus on the mechanics of using Excel, its use is completely optional and is available separately from the book. That format allows other instructors that do not use Excel and/or would prefer that their students practice developing Excel formulas on their own to do so without having to skip sections of the book chapters.